The weather is starting to get cold in Cincinnati and we have been craving soup! French Onion soup has always been a favorite, but traditionally calls for beef stock and chicken broth. We said, forget the animal products and make it veggie friendly. Earlier this year we made our own vegetable broth that was so flavorful it can rival any meat-based broth. 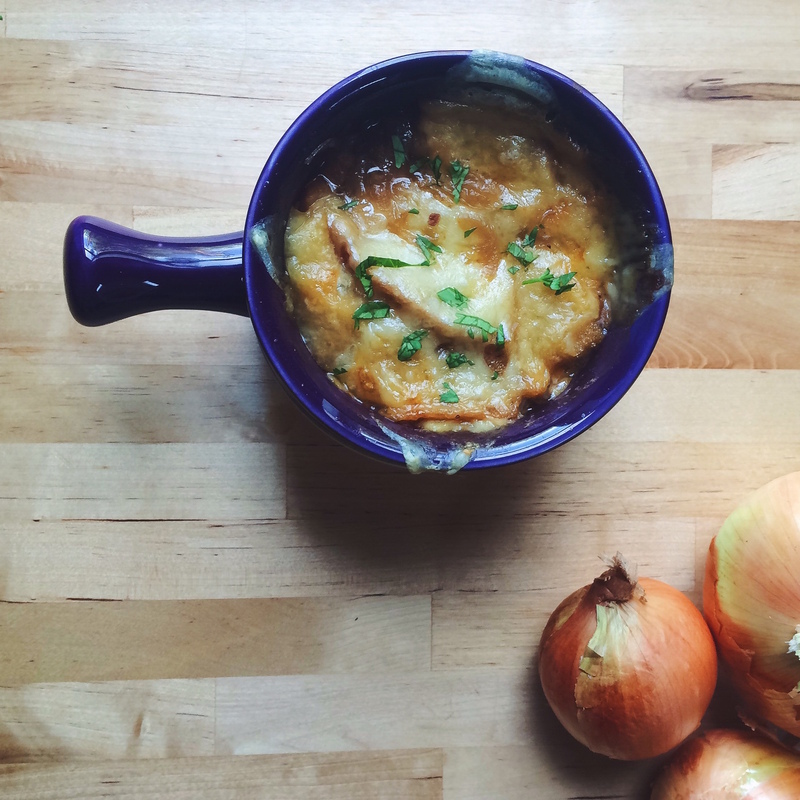 French Onion Soup is a simple recipe, we only had to replace one ingredient from the traditional recipe to make it veggie. Being vegetarian doesn’t mean you have to sacrifice your favorite foods, simply modify the ingredients and enjoy veggie versions of your classic go-to meals. In a large pot melt the butter over medium heat. When the butter has melted add the onions and put the lid on the pot. Sweat the onions for 15-20 minutes over medium-low heat until the pile has significantly reduced in size. Continue to cook the onions over medium heat stirring occasionally for about an hour. The onions should turn dark brown and become caramelized. Once the onions have caramelized, turn to high heat and deglaze the pan with the white wine. Stir for a minute or two then add the veggie broth. Reduce heat and simmer the soup for 15-20 minutes. Cut the italian bread to fit over the top of your oven safe bowls. Fill the bowls with soup, top with bread and a slice of cheese then put in the oven for 15 minutes, or until the cheese has melted and begins to bubble.